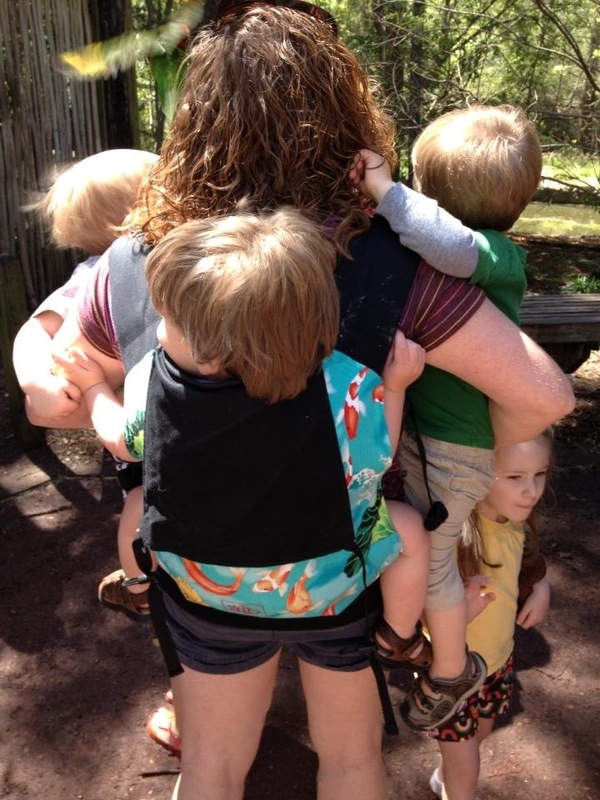 One Adult, Four Children, Two Carriers, and a Double Stroller… Now THAT’S a day at the zoo! Hi, my name is Crystal and I have a 3.5 year old little girl and twin 16 month old boys. My daughter was a preemie and I started wearing her the day we came home from the hospital. It helped her grow faster, regulate her body temperature and nurse better. When the twins came, I wore them because it was just so darn convenient with 3 babies and 1 mommy! In this picture, I am at the zoo with my three children and a little boy who had a 3 day old baby brother at home! All 5 of us trecked to the zoo with 2 different carriers and a double stroller! We had a amazing day. My son is on my back in an Olives and Applesauce toddler carrier. I have tried maybe dozens of carriers and find this to be one of the most comfortable and easiest carriers to use! We were visiting the Lorikeet aviary and my other son was a little unnerved by the birds. He needed a hug, as did the little boy that was with us. You do what you have to do, you know?? Thank goodness for the carriers though! After a long day at the zoo, we walked to the car with a baby on my back in the OA carrier, one on my front in a Hoppediz wrap and 2 in the stroller. Everyone was happy, tired and satisfied. I was happy that I could take 4 kids under 3 to the zoo and have a peaceful day. I have at least one wrap with me always! This picture was taken in April of 2013. I don’t wear my babies for one reason in particular. It feels right, it’s easy, and I can give them what they need while still accomplishing what I need. And yeah, it’s totally convenient.